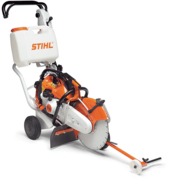 Stihl has a rnage of accessories to compliment their outstanding quick-cut demo saws. Amoungst these is the FW20 with two different model, one model that fits the TS420 and TS500i and the other model is suitable for the TS700 and TS800. The trolley removes the need for the operator to physically hold the tool in their hands and attempt to cut a straight line. Its snug fit and straight aligment gives you the optimum amount of control over the direction of the saw making straight lines so easy to cut. The cart improves the operators handling of the trolley increasing its cutting performance and provides a forward weight orientation with no tools required to insert the saw into the trolley. The wheels in the cart are supported by sealed ball bearigs and the large deflector flat protects the operator and trolley from debris. 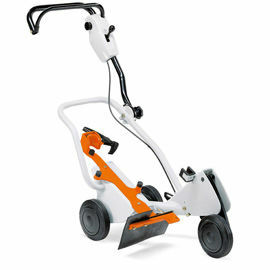 The handle folds for easy transport making it compact and ideal for those builders on the move from site to site also. Both tools look exactly the same and operate in the same way and are the same price. The ball bearing wheels make the trolley a pleasure to operate and a smooth tool to push. No tools required means that the demo saw can be easily equipped into the trolley with your hands only making it easy to use on site. The solid unit means that it is durable and strong. Perfect for those rough sites where everything seems to get damaged. The trolley tightly grips the saw and allows for an extremely accurate cut and prevents users from getting fatigued easily.